Do you like to eat potato? Well, potatoes are not just great for any meals but they are good for our body too. One medium-size (5.3 ounce) skin-on US potato contains just 110 calories per serving, boasts more potassium (620g) than a banana, provides almost half the daily value of vitamin C (45 percent) and contains no fat, sodium or cholesterol. So who say potato is fattening? It's not true. Hey! I also learnt that we can create many delectable dishes using potatoes after attending the US Potato Culinary Festival Kuala Lumpur 2015 recently at Vila Danieli, Sheraton Imperial Kuala Lumpur. US Potato Culinary Festival organized by the US Potato Board, it is bi-annual culinary fest offer a month long smorgasbord of dining delights to foodies. 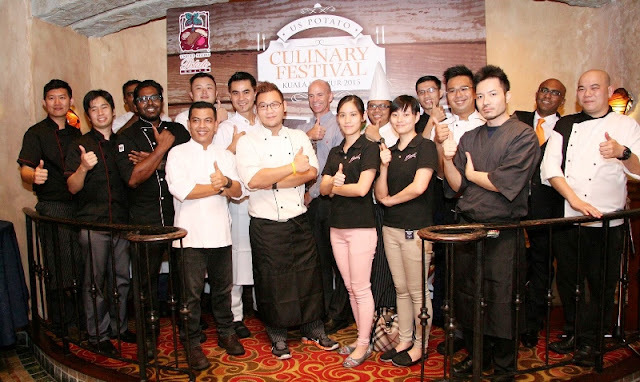 The US Potato Culinary Festival will run from 1st till 30th June 2015 at a total of 13 top dining venues around the Klang Valley, each of which will feature a mouthwatering assortment of unique and fusion dishes that elevate the versatility, nutritional benefits and superior taste of quality US potatoes. After going through all the exquisite dishes that created by the chef, I was like amaze and some of the food I can’t possibility think of it’s from potato. The versatility of US potatoes has resulted in these chefs creating some truly creative variations of potato frittatas, potato mash-ups, potato ice cream and even potato smoothies… omg it’s so hearty and filling too. Well, the chefs of all the participating restaurants have been tasked with inventing the most unique and delectable recipes they can conceive using quality US potatoes and they will be serving these wonderful potato dishes at their outlets around the Klang Valley in June. Through this festival, the US Potato Board aims to showcase how US potatoes can be used as a main ingredient in a wide array of recipes from appetizers to desserts. This will increase the public’s interest in enjoying US potatoes in new, exciting and healthier ways. While most us are used to enjoy potatoes in forms such as fried, mashed or baked, the humble potato when cooked discerningly is in fact one of the healthiest vegetables we consume. A healthy, balanced meal can be just as tasteful. Regardless of baked, mashed, roasted or fried, US potatoes have a remarkable ability to enhance whatever dish is served with them, enhancing presentation, adding value and appetite appeal. If you would like to experience the difference in cooking with quality US potatoes can find these them in all leading supermarkets and hypermarkets in Malaysia. Plus many leading restaurants and QSR chains also serve US potatoes due to their quality and superior taste. What is your favourite potato dish?